About 45,000 residents of the German city of Koblenz are being evacuated as work begins to defuse a World War II bomb found in the River Rhine. Everyone living within a 2km (1.25 mile) radius of the bomb site has been ordered to leave the area. 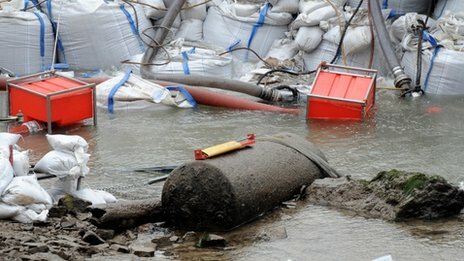 The 1.8 tonne bomb - dropped by the Royal Air Force (RAF) - was uncovered after water levels in the Rhine fell significantly as a result of a prolonged dry spell. Experts will defuse the bomb on Sunday.